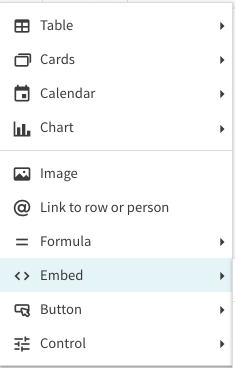 While you can embed content into your Coda docs using the formula language with the Embed and Image formulas, the easiest way to embed content is right from the + menu. Before embedding content, make sure that the sharing settings are set to public. If you ever have any issues, we recommend trying the Embed formula with the force parameter. Many URLs will work out-of-the-box with the Embed formula, but some may not display as desired by default. 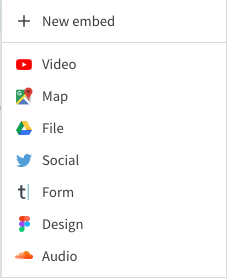 For instance, content that needs you to log into an account to view or that does not support the oEmbed format (such as a private dashboard) may result in an error or show only basic information. 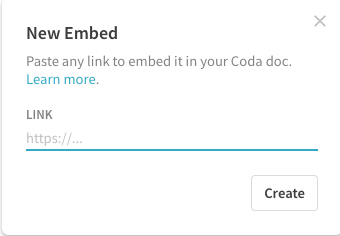 When embedding from Mode Analytics, make sure to grab the entire URL from the URL bar of the recent report, then add "/embed" to the end of the link (using the Embed formula), otherwise the report won't render in Coda.